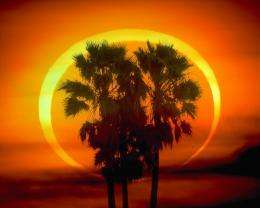 "The ring of fire:" Astrophotographer Dennis L. Mammana photographed this annular eclipse behind palm trees in January 1994. Credit: D. L. Mammana. An annular eclipse occurs when the Moon passes directly in front of the sun, but the lunar disk is not quite wide enough to cover the entire star. At maximum, the Moon forms a "black hole" in the center of the sun. The path of annularity is a strip about 300 km wide and thousands of km long. It stretches from China and Japan, across the Pacific Ocean, to the middle of North America. In the United States, the afternoon sun will become a luminous ring in places such as Medford, Oregon; Chico, California; Reno, Nevada; St. George, Utah; Albuquerque, New Mexico, and Lubbock, Texas. Outside of this relatively narrow zone, the eclipse will be partial. Observers almost everywhere west of the Mississippi will see a crescent-shaped sun as the Moon passes by off-center. "I like to compare different types of eclipses on a scale of 1 to 10 as visual spectacles," says NASA's leading eclipse expert, Fred Espenak of the Goddard Space Flight Center. "If a partial eclipse is a 5 then an annular eclipse is a 9." This event should not be confused with a total eclipse. In a total eclipse, the Moon covers the entire surface of the sun, bringing an eerie twilight to observers in the path of totality and revealing the suns ghostly corona. "On that scale of 1 to 10," he adds, "a total eclipse is 'a million!' It's completely off the charts compared to any other astronomical event." 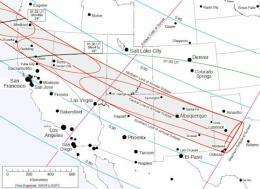 The next total eclipse in the USA is in the year 2017. The path of annularity cuts across the continental United States at sunset on May 20, 2012. A global map is also available. Until then, May 20th of this year will have to do. Annular eclipses have a special charm all their own. During an annular eclipse, sunbeams turn into little rings of light. The best place to see this is on the sun-dappled ground beneath a leafy tree. Hundreds of circular shadows can be found there. You can also make a handy solar projector by criss-crossing your fingers waffle-style. Rays of light beaming through the gaps will have the same shape as the eclipsed sun. Be careful when looking directly at the eclipsed sun, cautions Espenak. "The ring of sunlight during annularity is blindingly bright. Even though as much as 94% of the Sun's disk will be covered, you still need to use a solar filter or some type of projection technique. A #14 welder's glass is a good choice. There are also many commercially-available solar filters." "One of the unique things about this eclipse for watchers in the USA is that the Sun will still be in deep partial eclipse at sunset, making for some great photographic opportunities," he continues. "In western Texas around Lubbock, the sun actually sets during the annular phase." A swollen red sun with a black hole in the middle? Maybe 9 out of 10 isnt so bad, after all. Damn! It is missing my place by about 250 miles. BAH! I'm missing it by 400 miles. Maybe i will just drive there. My house is in the path for 2017. A total eclipse observable from our hot tub. Might head to Medford for this one, though. I wonder what will creationists say about this 'unperfect' solar eclipse. What does this post have to do with creationism?